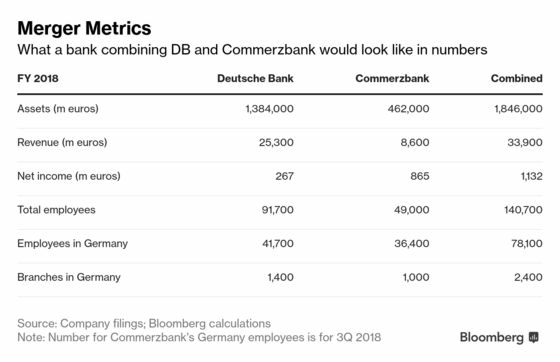 (Bloomberg) -- Germany would need shares of Commerzbank AG to more than triple to break even on its investment in the lender, the Finance Ministry told lawmakers in response to questions about the bank’s merger talks with Deutsche Bank AG. The government, which bailed out Commerzbank during the financial crisis, still owned about 15.6 percent in the lender at the end of 2017, it said in a written response sent March 28. To exit the investment without a loss, it would need a share price of 26 euros, compared with about 7.80 euros now. The Finance Ministry declined to say at what price it would vote for a takeover or whether it would keep its stake or seek to exit. Finance Minister Olaf Scholz has been among the few policy makers to signal support for a potential deal, calling publicly for national lenders big enough to compete with international rivals and serve the country’s export-driven economy. But opposition has been increasing as labor unions fear the loss of tens of thousands of jobs and lawmakers across the political spectrum question the rationale for a deal. Regulators have expressed skepticism about a tie-up behind closed doors. Internal obstacles to a deal have come to the fore as well after almost five weeks of talks. Deutsche Bank estimates it could lose the equivalent of close to a fifth of Commerzbank’s annual revenue should it go ahead with a takeover, as clients would seek to reduce their exposure to the combined lender, people familiar with the matter have said. A breakdown of the talks could reignite interest among foreign rivals. Banks including BNP Paribas SA and UniCredit SpA have reached out in the past to the German government about Commerzbank, people familiar with the matter have said. UniCredit is preparing a takeover bid should the talks with Deutsche Bank fall through, the Financial Times has reported, while Manager Magazin reported on Tuesday that ING is also interested in Commerzbank. Deutsche Bank Chief Executive Officer Christian Sewing and his counterpart at Commerzbank, Martin Zielke, have emphasized the discussions are open-ended and they’ll only agree to a deal if the numbers work out. Yet the alternative of continuing on their own is equally difficult -- shares of both banks have lost more than 90 percent from their peaks, and both are struggling to restore revenue growth after years of trying to turn around their businesses. Commerzbank rose 3.1 percent in Frankfurt trading on Tuesday, and Deutsche Bank gained 1.7 percent. Scholz and his deputy Joerg Kukies had encouraged talks to help the lenders get their act together before the next economic slowdown hits. In the months running up to the formal talks, the officials had intensified discussions with leaders of Deutsche Bank as well as Commerzbank. The Finance Ministry said in its written statement that while it doesn’t keep records on what’s being discussed in such talks, they regularly include the topic of strategic options for individual firms and how they’re viewed by the government. At two events where such discussions were held with Deutsche Bank, other financial services firms also participated, the Finance Ministry said. Among them were hedge funds Eisler Capital and Rokos Capital Management, as well as BNP Paribas SA Chairman Jean Lemierre. It’s not unusual for financial services companies to discuss the state of markets and the industry with government officials or institutions such as central banks that are tasked with overseeing these markets.